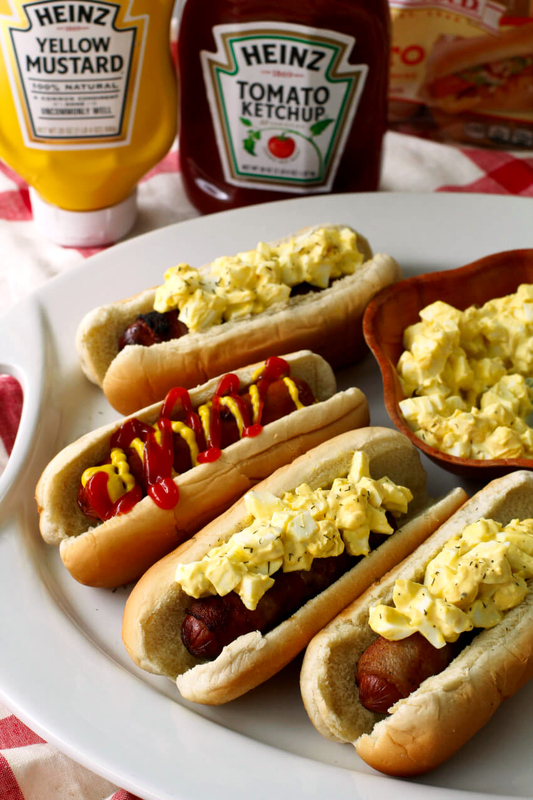 Bacon Wrapped Egg Salad Dogs are made by wrapping hot dogs with smoky bacon and topping them with creamy egg salad. You'll want to make this delicious spin on the classic hot dog all summer long! If there is one thing that I make again and again during grilling season, it's hot dogs. When I even mention firing up the grill, I am immediately met with pleas for hot dogs from my family. I'll tell you, my kiddos love hot dogs. I haven't met many kids who don't! My husband and I are hot dog fans, too, so it doesn't usually take too much convincing from the kids to add some hot dogs to our menu plan. The kids are a big fan of the classic Oscar Mayer Hot Dog topped with Heinz Yellow Mustard and Heinz Ketchup on a soft Country Potato Hot Dog Bun. As for my husband and I, well, we look at hot dogs as a blank palette ready for any kind of topping I can dream up! That's right, hot dogs are far from boring in this house. While I am totally okay with keeping it simple every now and then, I find that hot dogs are super tasty will all kinds of fun twists. You could go with a taco dog and throw on some salsa and shredded cheese. Or how about a BLT dog?! A bacon, lettuce, and tomato hot dog is so good! I'll have to tell you, though, my latest creation is my best one yet. 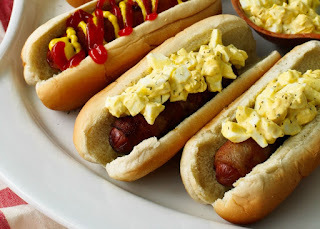 These Bacon Wrapped Egg Salad Dogs were a homerun! Bacon and eggs are like peas and carrots, am I right? The flavors just go together so perfectly. Yes, even on a hot dog. Trust me, you guys are going to love it! The first thing you need to do to make these Bacon Wrapped Egg Salad Dogs is head to your local Walmart to pick up the key ingredients. 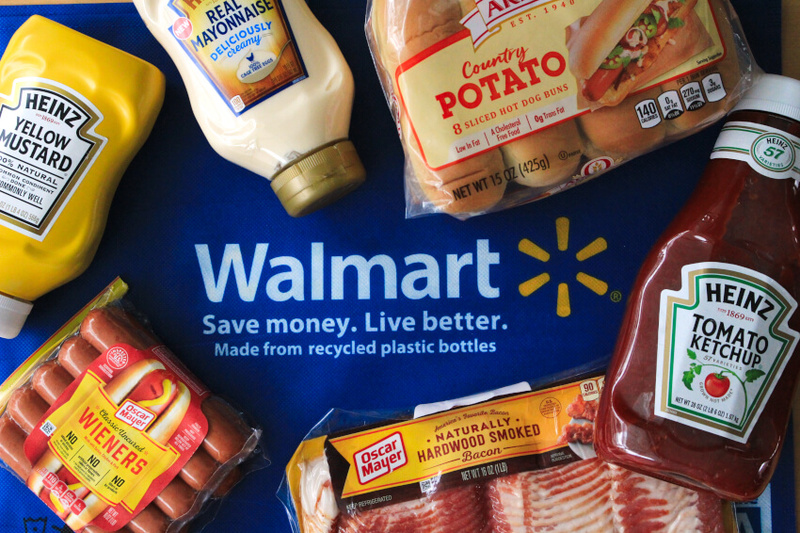 Have you tried the Walmart Online Grocery Pickup yet? It is going to save you tons of time shopping this summer, which means more time for fun in the sun and grilling hot dogs! Genius, right? It's a simple order online process and easy pickup at the store. It's a total win! 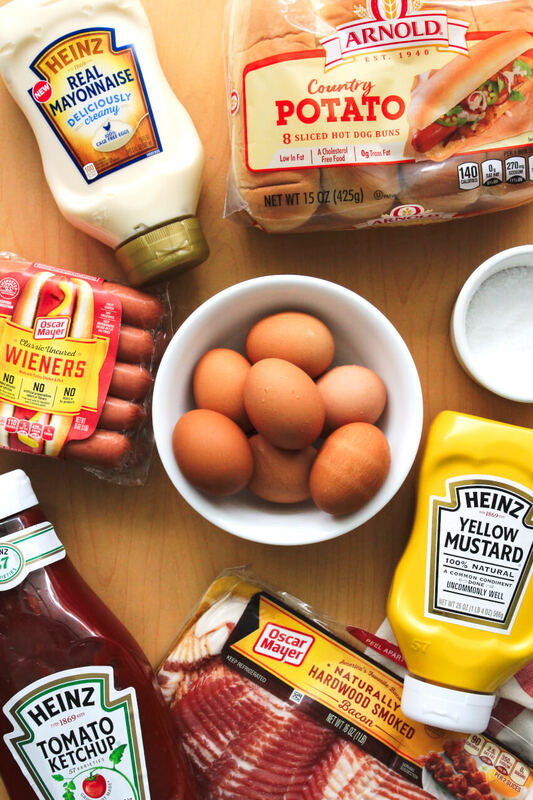 When I went to Walmart, I picked up some Heinz Mayo and Heinz Yellow Mustard to make a super simple (yet totally delish) egg salad to go on top of the hot dogs. My egg salad is made with hard-boiled eggs, Heinz Mayo, Heinz Yellow Mustard, and just a pinch of salt and pepper. The Heinz Mayo is extra creamy is perfect for egg salad! I also picked up some classic Oscar Mayer Wieners and Oscar Mayer Bacon from Walmart for the bacon-wrapped hot dogs. I am a firm believer that everything is better with bacon, and these hot dogs are no exception. One slice of bacon is the perfect size to wrap around a hot dog and is easily secured with a couple of toothpicks. Once everything is prepped, the egg salad is sent to the fridge to chill while the hot dogs hit the grill. One important tip for grilling the hot dogs is to keep an eye on them! The bacon drippings can cause some flare-ups, so you'll want these dogs to have your full attention while grilling. Once the bacon is golden and crisp, you'll be ready to top them with the egg salad and dig in. If you have been looking for ways to add some flavor to your summer, you have found it friends! 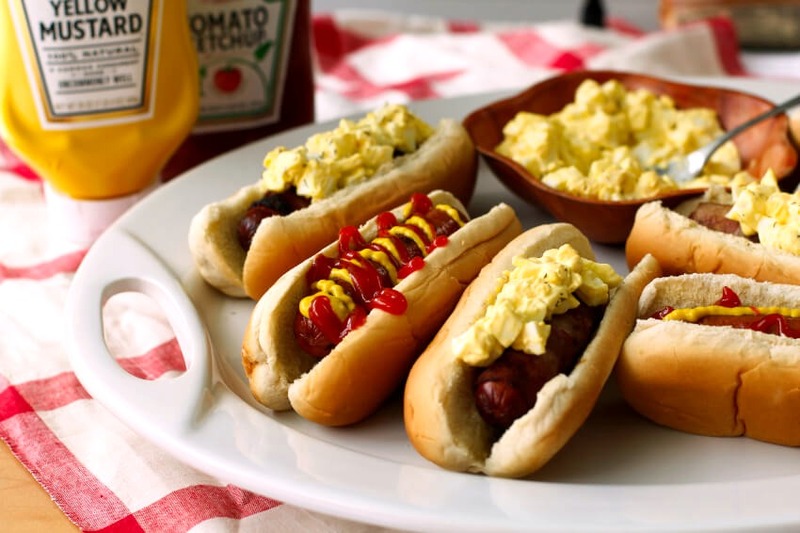 Here’s the recipe for my simple go-to hot dog topped with Heinz Ketchup and Mustard, AND my new favorite Bacon Wrapped Egg Salad Hot Dogs! Enjoy and happy grilling! 1. Add the eggs to a pot of water, making sure that there is at least 1 inch of water covering the eggs. Bring to a boil and boil for 1 1/2 minutes. Remove the pot from the heat, cover, and let the eggs sit in the hot water for 10 minutes. Remove the eggs, place into an ice bath and let sit for an additional 10 minutes. Peel and chop the eggs. 2. In a bowl, combine the hard-boiled eggs, Heinz Mayo, Heinz Yellow Mustard, salt, and pepper. Cover and refrigerate until ready to serve. 3. Wrap each hot dog with one slice of bacon and secure at each end with toothpicks. Grill over medium-high heat for 10-12 minutes, or until bacon is golden and cooked through. 4. 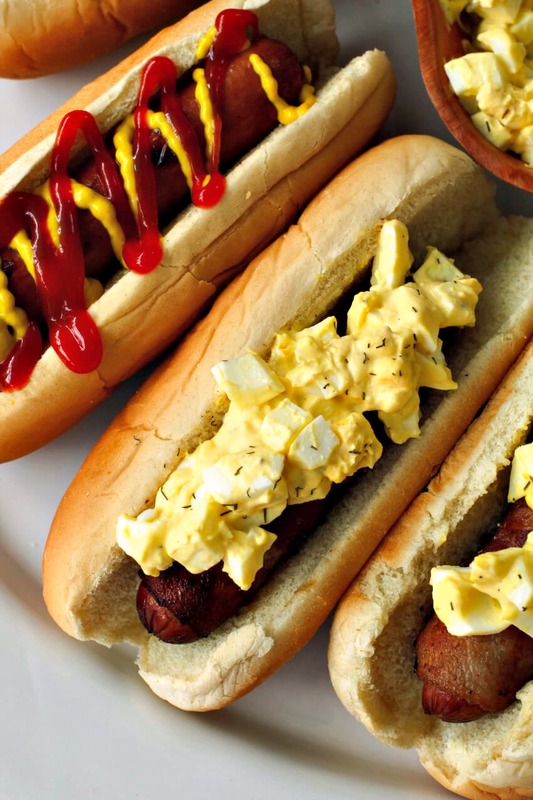 Serve the hot dogs on the Country Potato Hot Dog Buns and top with the egg salad. 5. 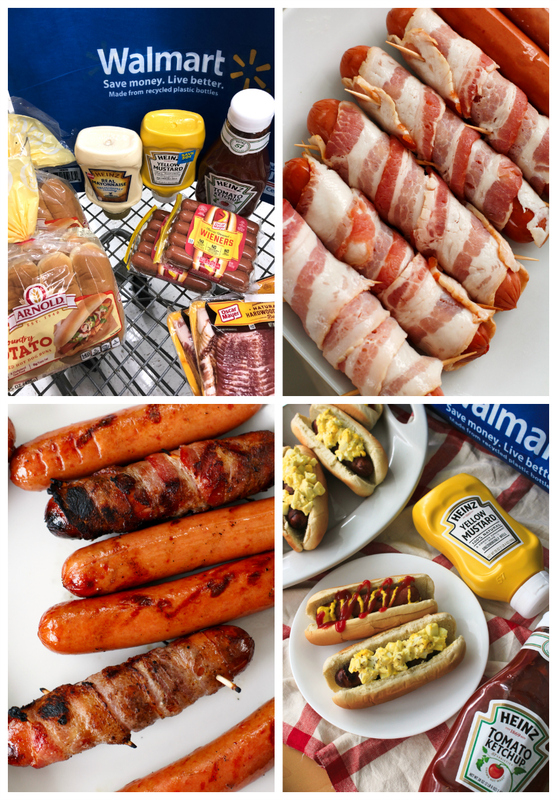 FOR CLASSIC HOT DOGS: Grill Oscar Mayer Wieners alongside your bacon-wrapped hot dogs. Serve on Country Potato Hot Dog Buns topped with Heinz Ketchup and Heinz Yellow Mustard. Do not leave hot dogs unattended while grilling. They will need to be moved around frequently to avoid flare-ups from the bacon drippings.